Bear with me, this will get weirdly meta. Let's say that there was a sci-fi television show called Spectrum about ten years ago. Despite being well-loved by its fans, it was cancelled while they were filming episode 10. Since then, the actors and other folks on the show went on with their careers with varying degrees of success. Ray Nearly, who played the pilot, has done okay for himself with a stream of bit parts and voice-over gigs, but part and parcel of his career includes making the con circuit, making appearances and doing signings and such. What Nearly experiences during his latest set of travels is the plot of the web comedy series Con Man. The series is loosely based on what actor Alan Tudyk, writer of the series, has seen/experienced in the ten years since Firefly was cancelled. The Spectrum comic I'm reviewing, then, is a story based on the stories in that fictional TV show from a decade ago. 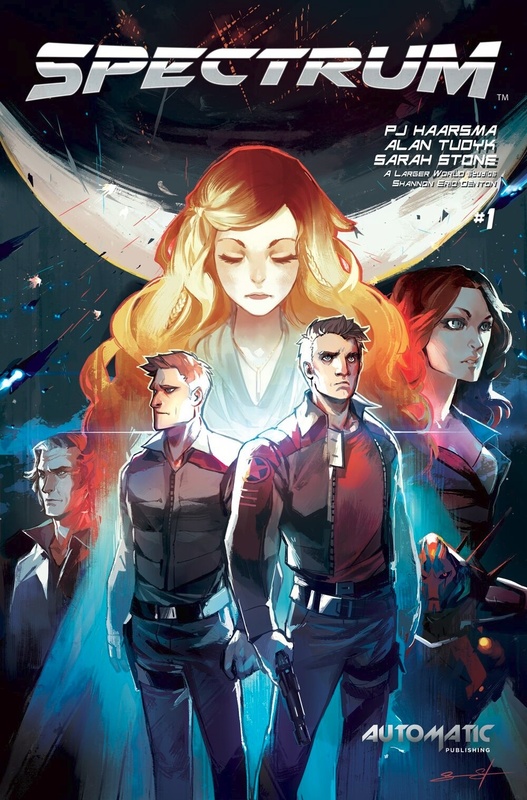 I don't believe the comic is supposed to come across as something that was being published as contemporary with the Spectrum show or an adaptation of it, but rather a continuation of the property, much like how the Firefly comics have been published. However, instead of picking up where the TV show allegedly left off, we're given what seems to be the first part of an origin story of how the crew first came together. Now, given all that backstory, there's a pretty large chance of making a comic that doesn't make any sense to someone coming to it cold. What impressed me, though, was that it's written as if it's just a new sci-fi comic for some brand new property. None of that backstory is needed at all; you can just pick up the comic and read as a 'straight' sci-fi tale at face value. And not only does it make sense, but it's pretty good. I think that's partly by starting with an origin type story, and we have a natural manner in which to introduce the characters to the reader by way of the other characters they're meeting for the first time. It also has a natural pacing that doesn't try to immediately limit itself to getting all of the story in the single first issue, so it can get on with the further adventures. The first issue is clearly only a portion of the story, and we haven't met all the principle cast yet. Characterization is really only limited to the pilot and captain, but there's enough suspense built up in the plot alone to entice readers back for the next issue. It's really a solid first issue on its own, separate from Con Man and any of the snippets of the Spectrum show that were created for that. There is a danger, in the more long-term, of the comic not living up the premise given by Con Man. After all, it's easy to say, "Yeah, that was a great show that fans adored a decade ago" but considerably less easy to retroactively create such an ideal. The comedy that's in Con Man is a very different type of writing than the sci-fi in Spectrum. Fortunately, Tudyk has gotten help from noted sci-fi author PJ Haarsma, and he does a pretty admirable job for his first issue. I enjoyed Con Man well enough, but not so much that I was super-eager to track down all the bits associated with it. However, I'm glad the publisher provided a review copy of this book; it's much more solid than I would've anticipated and stands on its own, apart from the show, quite well.